Virtual Reality (VR) can have a tremendous impact upon people’s lives, however, it should be noted that VR is not for everyone and participation should be voluntary. The immersive impact of VR can be quite dramatic, which means that there are ethical considerations to take into account when using the technology. Should I allow people who are unable to express consent to experience VR? This is a very difficult question and one that opens up many ethical debates about altering an individual’s reality without their consent. If the participant is not able to consent, due to cognitive or communication difficulties, the simplest way to determine whether they should be allowed to participate is by seeking permission from a parent or guardian. Getting input from clinicians and therapists would also be beneficial. Before using the VR headset, it would also be worthwhile to see how a participant responds to the content when it is shown on a monitor. If there is a clear like or dislike outside of VR, the chances are that these feelings will be magnified once the VR headset is on. Is VR suitable for children? It is widely suggested that VR is not to be used by children under the age of 13. This is consistent with all mainstream headsets: Oculus, HTC Vive, Google Daydream and Gear-VR. We recommend that manufacturer guidance is adhered to in all cases. I hear VR can make people sick? Some VR experiences have been known to cause a sensation of sickness. This is due to the way the motion is handled and the way the device renders the video. The VR experiences made by Sensory Guru have been constructed in a way so that motion sickness is not a concern. However, it is important to proceed with caution. If you, or someone you work with feels sick, remove the headset immediately. What happens if I have a visual impairment or poor visual acuity? If the user has a significant visual impairment then it is likely that they will not benefit from the visual aspects of VR, although they may still benefit from the binaural 3D audio that the application offers. 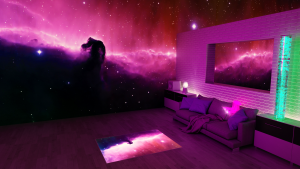 Sensory VR also has a VI mode that provides a UV like environment. The visual intensity is also adjustable, so it is possible to configure the experience to the needs of the user. Can I use VR if I wear glasses? Generally, the answer is yes, but it is worth checking the dimensions below with those of your glasses. Extremely large frames will not fit. Those who have ever, or currently live with symptoms of epilepsy such as severe dizziness, blackouts, seizures or loss of awareness, should consult a doctor before using VR. The content may include flashing images and repetitive sequences which, for a small portion of people with photosensitive epilepsy, could cause seizures. Do you have to wear a headset? To be fully immersed in the VR experience, participants need to wear a headset. However, participants can get a feel for the content before they wear the headset by watching the VR experience on a screen. This can help to take away some of the anxiety some people may have about being immersed in the virtual world. To find out how Sensory VR could benefit your users please contact us.